What is a Temari Ball? In Japanese, Temari literally translates to hand-ball. "Te" means hand, and "mari" means ball. According to The Japan Temari Association the Temari Ball evolved from Kemari (a football/kickball type game); and came to Japan from China between the 5th and 7th century A.D.
During the Edo Period (1603 to 1867), women in the Royal Court would make brightly colored balls for little girls which were used as toys - balls that were gently tossed around an played with. Making the balls also gave these women an opportunity to showcase their "stitching" talents to gain the attention of their favorite princes. 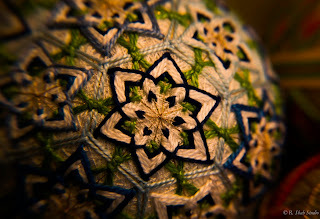 At first, Temari balls were limited to the upper class or royals as they were made from silk threads. 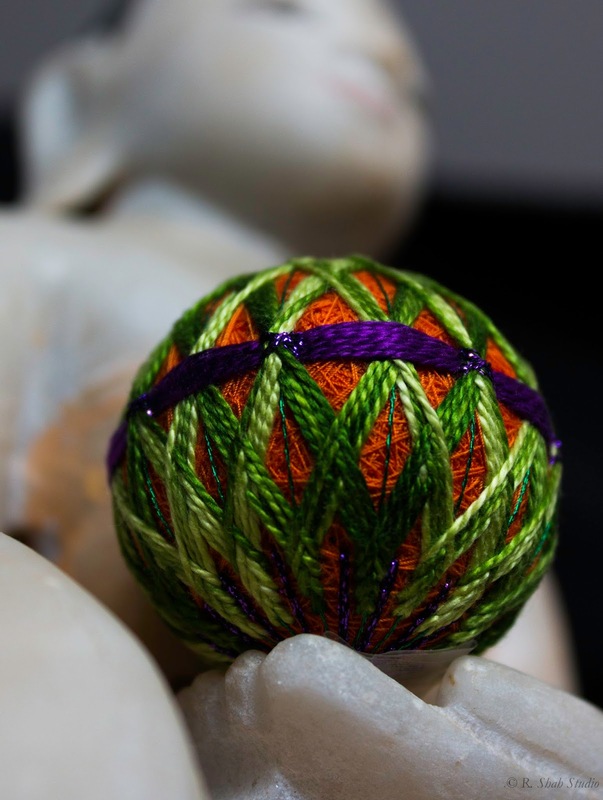 When cotton thread became available, the art of making the Temari Ball became accessible to the larger population; thus, the toy became a favorite of children all across Japan. 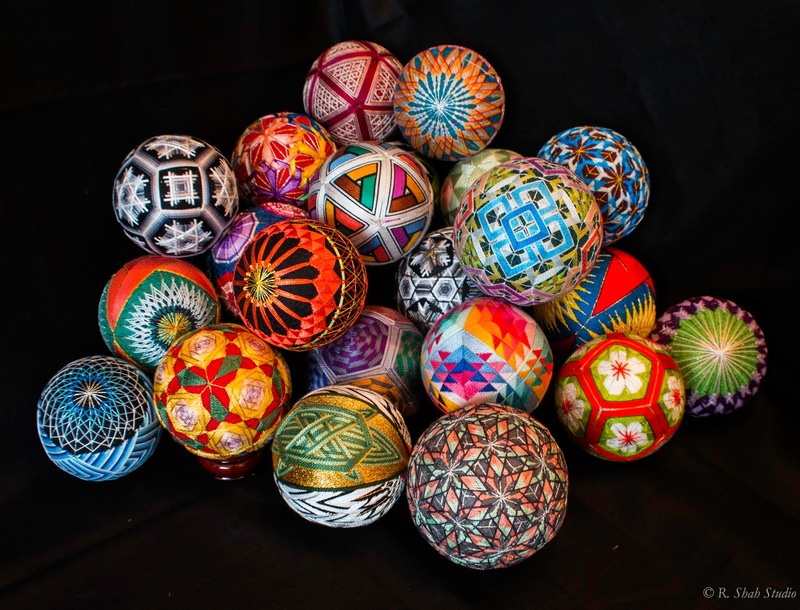 In fact, each prefecture (state) in Japan became associated with a specific style of Temari Ball based on local culture and materials. A Temari ball is made by using a core piece or filling that is shaped into a ball and sewn together. In olden days, this would be a ball of deer hide stuffed with pine needles, or discarded pieces of fabric. Today, often a styrofoam ball is used as the core. On top of this core, strips of fabric and thread would be sewn/stitched into a pattern. The tightness of each layer of stitching is what would allow the ball to bounce. Many times, small pebbles or rice would be placed into the core of the ball to allow for a "rattling" sound to delight young children as they played with the balls. 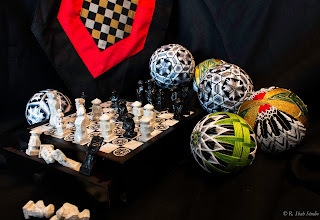 Over time, the beauty of stitching the balls into patterns and themes would lend an aesthetic beauty to the Temari Ball. They are now highly valued and cherished gifts that symbolize good luck and deep friendship. 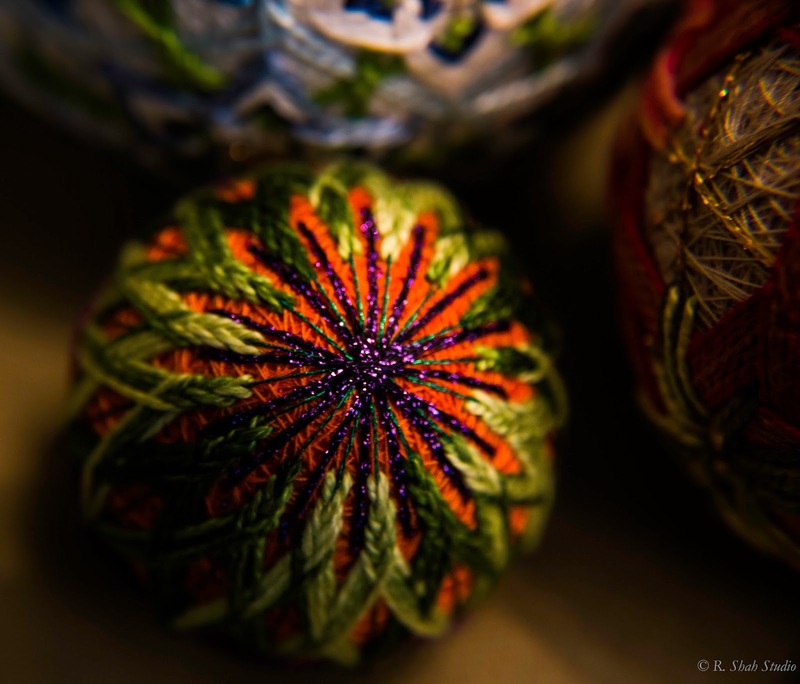 Temari Balls are usually made of vivid and brilliantly colored threads - to wish the recipient a happy life. 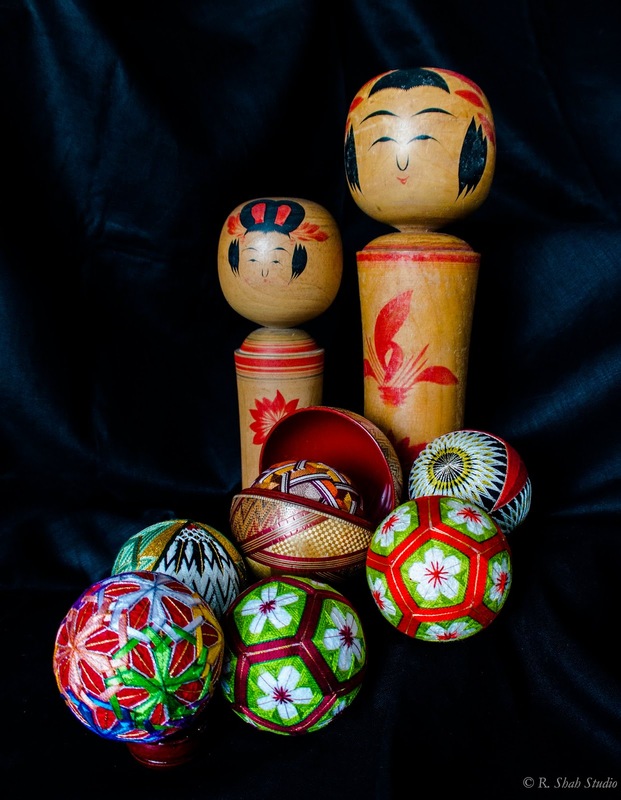 They are given out on auspicious occasions; but it is also traditional for a mother to make a Temari Ball for her daughter as a New Year's Gift in Japan. 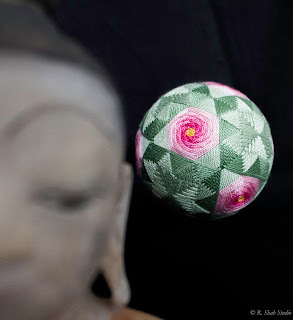 The art of making the Temari Ball is a learned skill. 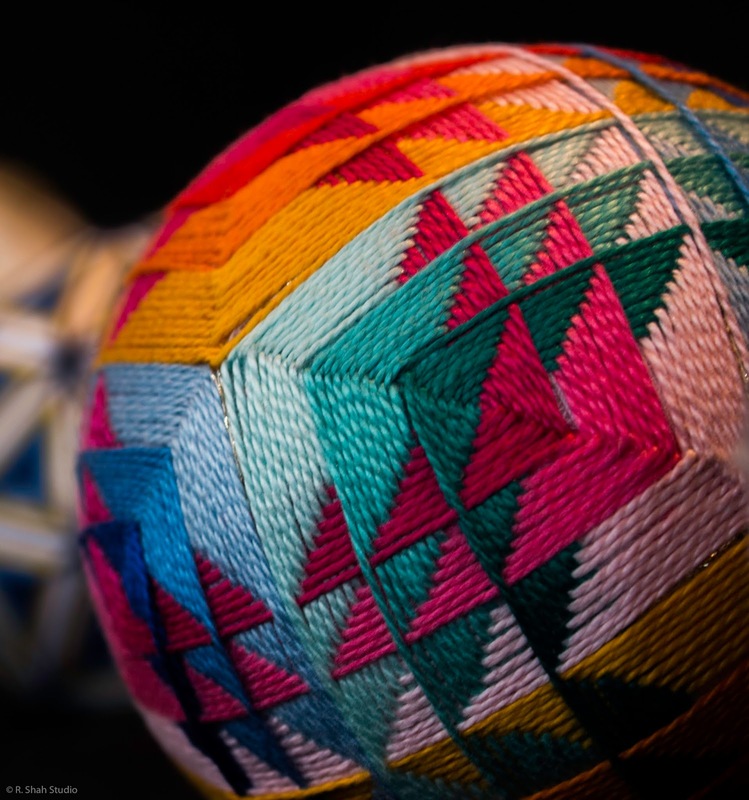 There are Masters of this craft who teach and there is even an official Certification that is administrated and managed by the Japan Temari Association in Tokyo, Japan. Recently, I had the good fortune to do a photo shoot for three friends of mine who are "Temari Ball Artists". 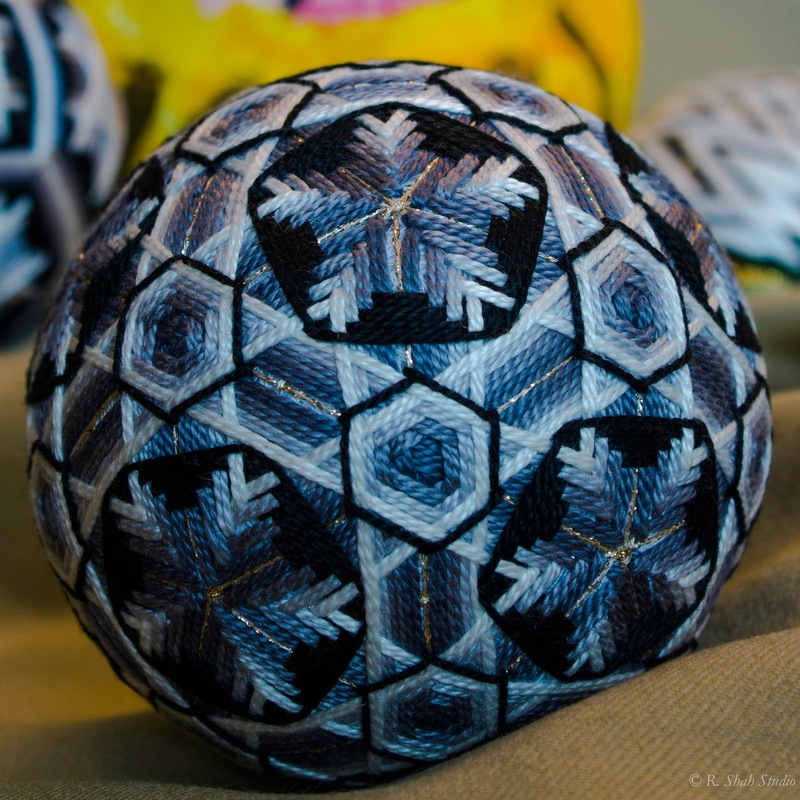 They have been studying this art for at least 2 years and spend anywhere from 4 to 7 to 25 hours stitching and sewing one Temari Ball! It is a skill requiring hours of dedication and focus. It was fun day of taking photos as we found different ways to "show off" the many Temari Balls they have made. Beautiful and vibrant colors everywhere! 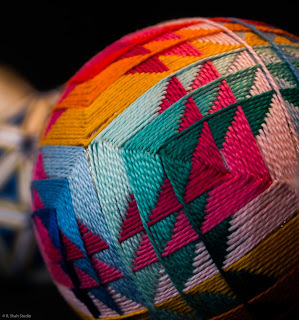 Temari patterns are often symmetrical and geometric. 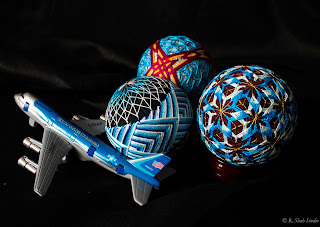 thread is used n the making of the Ball. as playtoys - but smaller ones can also be used in Jewelry. as surrounded by a "pond of green". This one is clearly showing off a snowflake. One can imagine many uses for the Temari Ball in one's home. I have a few tucked into an old hibachi table in my home. But I also feel that they are works of art - and can be displayed just as you would display a painting. Highlighted in your home as part of a shadow box or larger display. They are beautiful in their colors and in their patterns. For more information on the Temari Ball, please see the website http://www.temarikai.com. 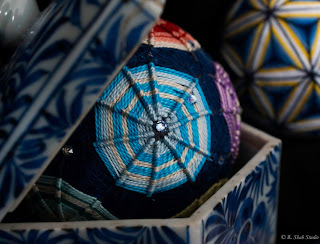 I will leave you with some more photos of these beautiful Temari Balls and urge you to check them out online or - if you are local to Tokyo - at the next Tokyo American Club International Bazaar! with Peace, In Art, to the Soul.